Select Login using your Windows account or enter your user name and password, and then click the Login button. On the Self Service Center home page, click Add a New Work Order. Tip: You can also add a new work order from the My Work Orders page. Enter a short summary of the problem in the Summary field. You can add more details (if necessary) in the Notes textbox at the bottom of the form. Select the Priority, Type, Sub-Type, and Category from the options in the drop-down lists based on the type of action required. Describe the problem or request in the Notes textbox. Click the File Name Browse button to locate the file that you want to attach. In the Add Attachment dialog, navigate to the location of the file, then click the OK button. Once you’ve submitted a Work Order, you can add a note, but you won’t be able to edit any of the information. On the View Work Order page, click the Add Notes button. On the Add Notes dialog, enter the information in the Notes textbox, then click the OK button. Click View My Work Orders from the Self Service Center home page. You can also view your work orders from the My Work Orders page from the My Work Orders link on the left pane of the Self Service Center. Click the Open Work Orders, Closed Work Orders, or All Work Orders tab to view your work orders. Click the ID link to view the details of the request. The table below provides a description of each of the fields contained in a work order. A level of urgency and impact to your organization, based on your company’s business rules and Service Level Agreements (SLA). Resolution A short description of what was done to resolve the issue. On the View Work Order page, click the Cancel Work Order button on the Work Order toolbar. If you don’t see the Work Order, click the All Work Orders tab. On the Cancel Work Order confirmation dialog, enter a reason for the cancelation. Submit your maintenance request through TrackIt! – our on-line maintenance portal. 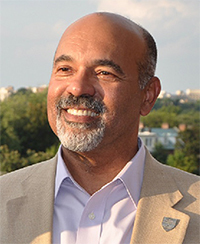 Ronald Mason, Jr., J.D., began his tenure as the ninth president of the University of the District of Columbia on July 1, 2015. His reputation for strong leadership and responsible governance is bolstered by more than 30 years of experience in the higher education, community development, and legal fields. UDC Board Chair Elaine A. Crider describes Mason as a proven, highly motivated and accomplished administrator who is exceptionally and uniquely suited to build upon the successes that the University has achieved in recent years. Prior to being appointed president of the University of the District of Columbia, Mr. Mason was the seventh president of the Southern University and A&M College System, where he served a five-year term as the chief executive officer of the nation’s other Historically Black College and University System and provided oversight for the System’s five campuses. Serving as Southern University’s president during a period of severe budget cuts, Mason improved human and technology infrastructures, established online degree options, and lead the campuses through a difficult transition process. Moreover, concerned about the social and economic barriers that stand in the way of educational opportunities for the underserved and black men in particular, Mason spearheaded an initiative titled the “Five-Fifths Agenda for America.” Its goals are to bring truth to the conversation about the relationship between America and black men, increase the number of college degrees among black men, and increase the number of black male teachers. Before joining the Southern University System, Mason was president of Jackson State University (MS). Under his leadership, Jackson State experienced unprecedented growth in areas of fundraising, information technology proficiency, and the construction of new buildings. Earlier in his career, President Mason developed a successful record of progressive leadership in various positions over an 18-year period at Tulane University in New Orleans, including senior vice president, general counsel, and vice president for finance and operations. He also served as the founder and executive director of the National Center for the Urban Community at Tulane and Xavier Universities. President Mason is fond of saying, “I used to be a lawyer,” which references the start of his career as an attorney with the Southern Cooperative Development Fund, Inc. Among his numerous public service and professional activities, Mr. Mason holds current membership on the White House Board of Advisors for Historically Black Colleges and Universities and the Board of Directors of the Thurgood Marshall College Fund. He also serves on the Board of the American University of Nigeria and the International Foundation for Education and Self Help. His previous board service includes the American Council on Education and the National Advisory Committee on Institutional Quality and Integrity, Office of Postsecondary Education. A native of New Orleans, President Mason received his B.A. and J.D. degrees from Columbia University in New York City. He attended the Harvard Institute of Educational Management and is the recipient of the Mayor’s Medal of Honor from the City of New Orleans, the Martin Luther King Lifetime Achievement Award from Dillard, Loyola, Tulane, and Xavier universities, and was one of five recipients of Columbia University’s 2008 John Jay Award for distinguished alumni. He is married to the former Belinda DeCuir and has one daughter, Nia, and two sons, Jared and Kenan.